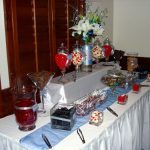 Blue themed lolly buffet including lollies and chocolates (colour themed lollies are available), table linen and skirting, decorative glass vases with themed lolly tags, fresh white lily and blue orchid centrepiece, tongs and scoops and white lolly bags. Price – Hired items – Email us for pricing. 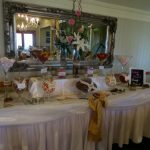 Vintage themed lolly buffet including lollies and chocolates (colour themed lollies are available), white table linen (black also available), decorative glass vases with themed lolly tags, fresh floral centrepiece, tongs & scoops.